How Is This Corporate Flack Running for Congress As an ‘Outsider’? Matt Miller has received hundreds of thousands of dollars for his work for PR and consultancy firms, yet the LA Times characterizes him as outside the system. Note: An earlier version of this article contained factual errors that have since been corrected — see below. 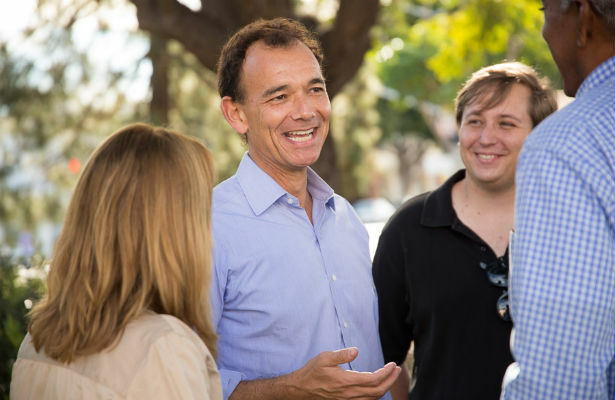 Out of a crowded field of candidates hoping to replace retiring Representative Henry Waxman in Los Angeles, Democrat Matt Miller has attempted to distinguish himself by touting a variety of experiences. Miller’s campaign advertisement lists his various positions as a radio show host, education expert, former Clinton administration official, and business adviser. As he announced his candidacy, Miller took a leave from The Washington Post and NBC, where he was a columnist and contributor. What hasn’t been reported is his other breadwinning job: PR consultant. Ethics forms filed by Miller to the House Clerk’s office, a standard procedure for any candidate for Congress, reveal that Miller received $239,099 from Burson-Marsteller, the influence and public relations firm, in 2013. The ethics forms show a laundry list of other corporate clients, including American Express, General Electric, Linder & Associates, RLM Finsbury and Walmart. The New York Times’s Mark Leibovich, in his write-up of the race, described Miller as a former consultant to McKinsey & Company. The ethics forms show that Miller continued to receive a salary at the firm up until announcing his run: $295,927 in 2013 and 2014, and $318,721 in the previous year, 2012. Many of Miller’s clients continued to pay him up until he announced his candidacy, including RLM Finsbury, which bills itself as a public affairs firm that helps influence lawmakers and regulators. RLM Finsbury says Miller left the firm as he launched his campaign. The many corporate consultancy gigs held by Miller may cast his policy and pundit positions into question. For instance, when Miller penned a column for the Post defending corporations that take full advantage of the tax code to dodge paying billions in corporate income taxes, he did not disclose at the time that he was being paid by GE, a company that has become a symbol of this problem. Miller has endorsed cutting entitlement programs such as Social Security. As PR Week reported, Miller’s Burson-Marsteller was retained by billionaire Pete Peterson’s Fix the Debt campaign to help advocate for spending cuts to reduce the national debt. Miller, in response to a query from Republic Report, says he has “always kept my editors and producers at my various outlets informed about my business activities, and have routinely made disclosures on air or in print where a reader or audience member should know of such work to avoid any conflict.” On KCRW radio, where Miller has hosted the popular show Left, Right, and Center, Miller says he has mentioned on air that he is an adviser to GE chief executive Jeffrey Immelt. ”I advised on strategy, policy and communications, and helped lead work on two reports issued by McKinsey’s education practice on the achievement gap and on elevating the teaching profession in the US. At Burson, I advised clients on external communications and reputation matters, and helped with client development,” Miller says. As Republic Report has reported, several lobbyists and consultants working in the world of corporate advocacy have made the jump to run for Congress this year. In Virginia, we revealed that Republican candidate Ed Gillespie has been quietly consulting for oil and gas lobbying groups, while also advising firms such as AT&T and Bank of America. In North Carolina, we disclosed the many financial industry clients of Taylor Griffin, an establishment backed candidate who failed in his primary bid against Congressman Walter Jones (R-NC). This post has been updated to correct and clarify information about the timing of Miller’s income from certain clients, in particular to clarify that Miller stopped working for the above-cited clients by the time he launched his campaign. We regret the error. Miller also says that his payments from GE and American Express related to his work advising President Obama’s Council on Jobs and Competitiveness. The two companies, Miller says, shared expenses for his services. After publication of this article, Miller contacted Republic Report but would not reveal the identity of his Burson-Marsteller clients.